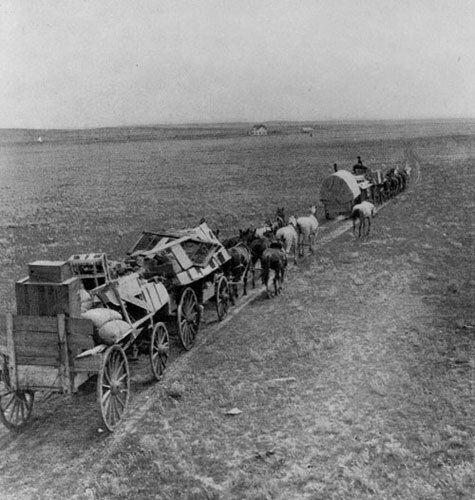 This photo was published in 1906 in The Canadian Magazine (Toronto, Volume 26, page 131) with this description: Settlers from the United States crossing the western prairies, heading for the wheat fields. While European migration to Saskatchewan has received considerable attention, relatively little is known about the experiences of American immigrants and the role they played in the settlement and development of the province. Before Americans crossed the border in any significant numbers, the influence of the United States had already made itself felt in the prairie region: indeed, the drive to build a transcontinental railway and settle the west was fuelled in part by the long-held fear of American Manifest Destiny. The salient features of Canadian land policy—homesteads, sectional survey, and railway land grants—were transplants from the United States. The end of the American land frontier in the 1890s precipitated the movement northwards. American immigrants—native-born and transplanted Canadians and Europeans—looked to western Canada, where free homestead land was available upon payment of a $10 registration fee, and where land was selling for as little as $2 an acre. Laurier’s Minister of the Interior, Clifford Sifton, instituted a program of land promotion and sent agents throughout the United States in search of American farmers with capital. Sifton deemed the United States the greatest source of first-class settlers because American immigrants had capital, goods, and experience in prairie farming, and because Ottawa considered them ethnically desirable—at least those with white skin. No attempt was made to recruit black agriculturalists, although a few hundred black families from Oklahoma entered Canada in 1910 and 1911, settling in Saskatchewan and Alberta. Estimates indicate that between 1901 and 1914, over 750,000 immigrants entered Canada from the United States. Although Alberta was the most common destination for American migrants coming to the Prairies, a significant number settled in Saskatchewan. During the period from 1905 to 1923, 332,155 immigrants arrived in Saskatchewan from the United States; the peak years were 1911–12 and 1912–13, when 46,158 and 45,147 immigrants respectively registered with border officials. In 1916, American-born comprised 36%, 30% and 8% of the foreign-born populations of Alberta, Saskatchewan and Manitoba respectively. When World War I began, American immigration dropped considerably. While settlers who came directly from Europe tended to emigrate in large groups and settle in blocs, Americans tended to travel alone or with immediate family. As a result, their presence, while ubiquitous, was also less apparent. Although spread throughout the southern part of the province, American immigrants tended to concentrate both in the southeastern section near the major rail lines and in the southwestern part, where Ranching played a major role in the local economy. While hyphenated Americans (those born in Europe but subsequently residing in nearby states such as Minnesota and North Dakota) often joined their former countrymen in newly formed rural communities, most immigrants from the United States were generally inconspicuous, even in areas of relatively high concentration. Yet their presence was noted: Americans were valued for both their wealth and experience in Farming, and were looked upon favourably by those who put stock in the fact that most Canadians and Americans shared the same Anglo-Celtic blood. Yet while appreciating American capital and Labour, many native-born Canadians in Saskatchewan were uneasy about certain aspects of American society and the threat of annexation. Many of these same people expressed some regret about the weakening of the British connection, in economic as well as social terms. Yet the sheer number of Americans by the end of the first decade of the 20th century, their investment in agriculture and business, and the technological expertise they brought with them ensured that they would play a major role in developing the province. American technology such as the steel plough, barbed wire, and the self-binding reaper, along with dryland farming techniques, facilitated the move into drier regions and the development of wheat monoculture. Many Saskatchewan communities (e.g., Climax, Mankota, Willmar) were American transplants. While British and eastern Canadian capital played a major part in the development of Saskatchewan’s ranching industry, recent literature asserts that cattle companies found it necessary to adopt American practices and employ American labour in order to cope with a challenging environment. A considerable number of American immigrants established their own cattle ranches in the Maple Creek area. Importation of agrarian movements such as the Patrons of Industry and the Farmers’ Alliance had a major impact on the development of populist organizations and the socialist movement in the province. While many of the original American settlers eventually left Saskatchewan, those who remained virtually disappeared into the fabric of provincial life. Yet, while their presence as a cultural group is barely discernible today, their legacy in terms of the contributions they made to the development of the province is visible in almost every facet of society. Sharp, P.F. 1947. “The American Farmer and the âLast Best West,'” Agricultural History 21: 65-74; Shepard, R.B. 1997. Deemed Unsuitable. Toronto: Umbrella Press; Widdis, R.W. 1998. With Scarcely a Ripple: Anglo-Canadian Migration into the United States and Western Canada, 1880-1910. Montreal: McGill-Queen's University Press.